From Jill Mislinski: For the past few years, we’ve been following a couple of transportation metrics: Vehicle Miles Traveled and Gasoline Volume Sales. For both series, we focus on the population adjusted data. 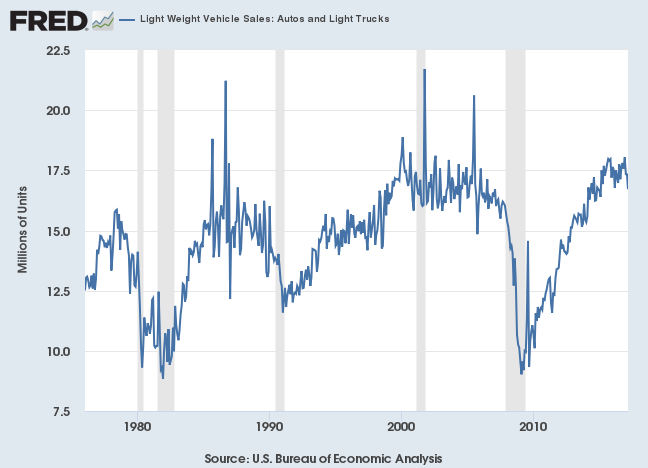 Let’s now do something similar with the Light Vehicle Sales report from Motor Intelligence and the Bureau of Economic Analysis. This data series stretches back to January 1976. Since that first data point, the Civilian Noninstitutional Population Age 16 and Over (i.e., driving age, not in the military, or an inmate) has risen about 66%. 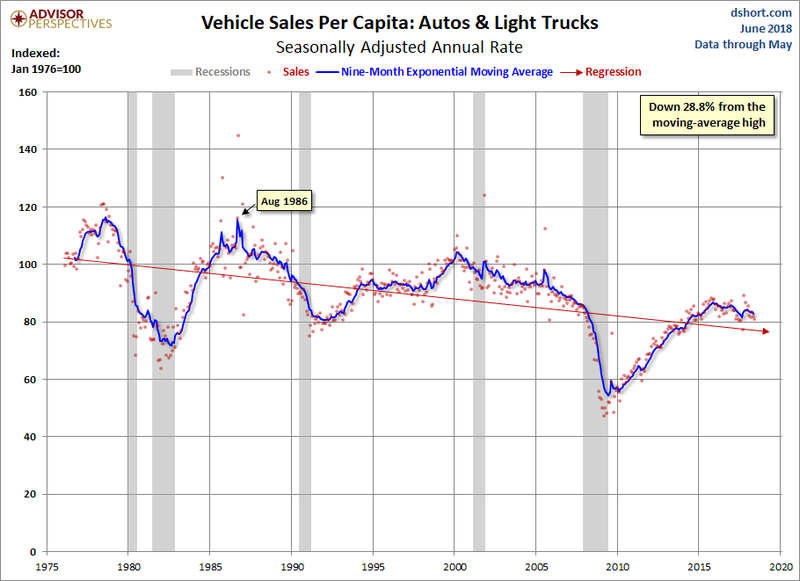 Here is a chart, courtesy of the FRED repository, of the raw data for the seasonally adjusted annualized number of new vehicles sold domestically in the reported month. This is a quite noisy series, to be sure. The absolute average month-over-month change is 4.4%. 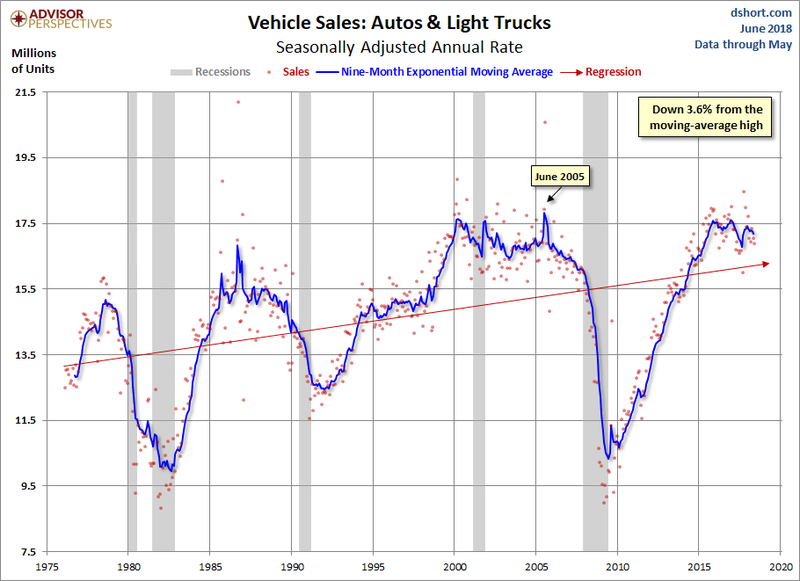 The latest data point is the May count published by Motor Intelligence, which shows a seasonally adjusted annual rate of 16.9 million units, which is a 1.0% decrease from the previous month’s figure from the BEA. The first chart shows the series since 2007, which illustrates the dramatic impact of the Great Recession. The blue line smooths the volatility with a nine-month exponential moving average suggested by our friend Bob Bronson of Bronson Capital Markets Research. 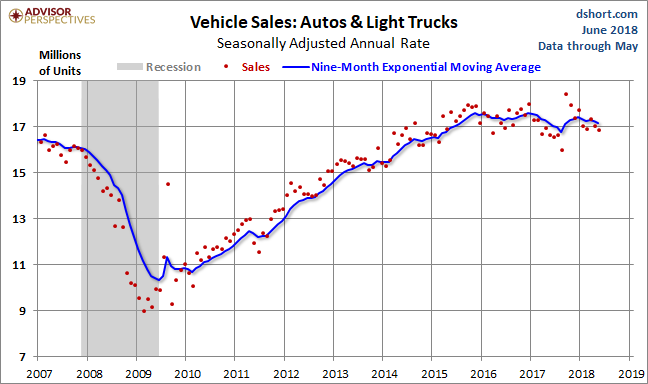 The moving average reduces the distortion of seasonal sales events (e.g., Memorial Day and Labor Day weekend) and thus helps us visualize the trend. Here is the complete series data from 1976. We’ve added a linear regression (the red line) to further illustrate the direction of the long-term trend. In the chart above, the latest moving average value is 3.6% below its record high in November 2005. We’ve created a per-capita version using the FRED’s CNP16OV series for the adjustment. We’ve indexed the numbers so that the first data point, January 1976, equals 100. The moving average for the per-capita series peaked in 1986. Thirty-plus years later, it is now down 28.8% from that 1986 peak. The First Trust NASDAQ Global Auto Index Fund (CARZ) was unchanged in premarket trading Monday. Year-to-date, CARZ has declined -4.60%, versus a 2.94% rise in the benchmark S&P 500 index during the same period. CARZ currently has an ETF Daily News SMART Grade of B (Buy), and is ranked #33 of 42 ETFs in the Consumer-Focused ETFs category. This article is brought to you courtesy of Advisor Perspectives.